Daily Stress Formula Capsules 180ct. Home > Supplements > Daily Stress Formula Capsules 180ct. 3 capsules daily, with or between meals. Broad-spectrum formula designed to promote mental relaxation and moderate the effects of occasional stress. In addition to promoting memory and cognitive function, preclinical investigation shows Bacopa monnieri maintains healthy enzyme activity in the brain, supporting the ability to deal with stress. In several clinical studies, bacopa supported learning and memory. A double-blind crossover trial suggested that rhodiola may help to moderate mild fatigue under stressful conditions. In a separate, double-blind, placebo-controlled pilot study, rhodiola provided support for physical and mental stress in students. Similarly, the amino acid l-tyrosine has indicated the potential to promote cognitive function and memory under stressful conditions. Eleutherococcus senticosus, or eleuthero, is used as an adaptogen to help bolster adrenal function and stress resistance. Like ashwagandha, it is highly revered for promoting energy, vitality and immune defense. Chamomile and lemon balm provide traditional support for calmness and relaxation. 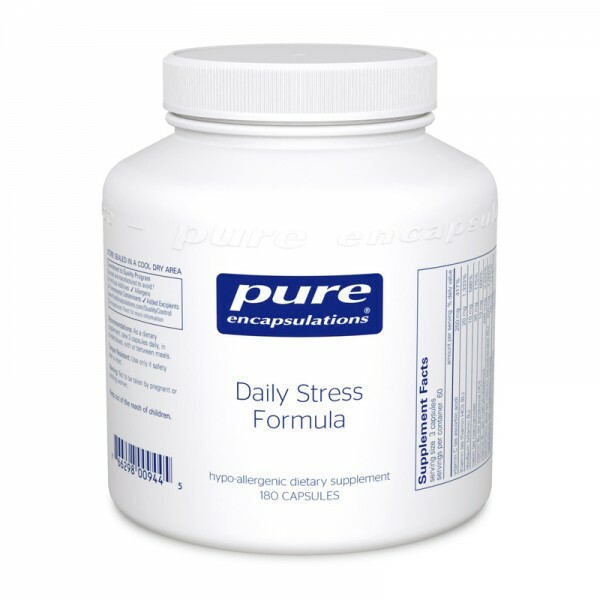 B vitamins and magnesium are included to help counter the effects of stress on healthy nutritional status. B-complex vitamins have also been associated with healthy neurotransmitter function and energy metabolism. Vitamin B5 is especially important for boosting healthy adrenal gland function to strengthen the body’s ability to withstand stress. Vitamin C provides important support for neutralizing free radicals generated by the stress response.